Thanks to Turner Classic Movies’ 31 Days of Oscar film lineup, I’ve been recording a ton of movies lately. DVR space is running out, so last week I made a tough decision: My oldest recordings would have to go. 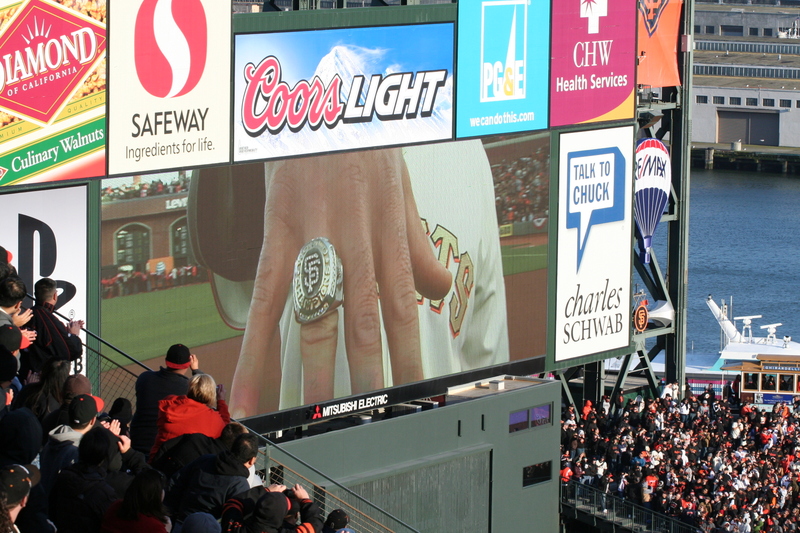 That included the broadcast of the 2010 World Series Ring Ceremony featuring the San Francisco Giants. Before I deleted it, I bid it a fond farewell by re-watching it – twice. I was in the stands at AT&T Park that April night, shivering, sporting more layers than a compost heap. Seeing the ceremony again nearly two years later brought feelings of joy, excitement and pride rushing back. I could have happily watched the Giants get their rings 10 more times – even though I still haven’t gotten around to viewing my recording of the 2012 World Series Parade. Why is that? You have to understand, I grew up just outside Cleveland, Ohio – a city that is passionate about sports, and its sports teams – no matter how many times they break our hearts. (The Indians, the Browns… and the Cavaliers. Oh, the Cavs.) None of my teams had won a championship in my lifetime… until the Giants did it in 2010. That first time was pretty special. The first thing that struck me as I re-watched the ceremony was how few in the 2010 lineup still play for the Giants. With the exception of Buster Posey and Pablo, the only guys from the 2010 team still on the roster are pitchers. I laughed at how young the players and coaches looked. Manager Bruce Bochy was sporting a lot more pepper than salt in his beard back then, while baby-faced Madison Bumgarner looked too boyish to even own a razor. Pablo Sandoval looked trim and fit. The players acted like little boys on Christmas morning. (Imagine Ralphie’s face when he gets his Official Red Ryder BB gun in A Christmas Story.) NLCS MVP Cody Ross got so excited, he nearly forgot to pick up his ring after all the handshakes. When he finally saw it he gushed, “Ah, it’s beautiful!” Tim Lincecum also beamed. “It’s gorgeous”, he said. Travis Ishikawa was on hand, looking a little mopey in his jersey and jeans. He was purportedly bitter to have been designated for assignment during 2011 spring training, and I’m not sure he wanted to be there. Assuming Brian Wilson does not return to the team in 2013 (the most likely outcome at this point), I wonder how he’ll participate in the ring ceremony in April? I’m not the only one with profound feelings of nostalgia about the 2010 San Francisco Giants. On February 6, I saw Bruch Bochy speak at the Commonwealth Club of California, where he was asked how he’ll manage to wear two World Series rings. Boch got very wistful, and explained that while he has yet to see his 2012 hardware, he’ll always be partial to his 2010 ring. He kept staring down at it, like it was still a shock to see it on his finger. I don’t yet have a ticket for San Francisco’s 2013 home opener or ring ceremony. My DVR is poised and ready but I still plan to be there in person. Rather than snapping up one of the nosebleed seats the Giants are offering, I will be throwing myself on the mercy of the secondary market. It could get ugly. It’ll definitely be costly.